Consisting of three Li-Ion cells in a 3S-1P configuration, GlobTek GS-1907 battery pack provides 28.86WHr (2.6AHr) of power to mobile applications requiring battery backup with simple cost effective charging. It includes battery charger circuits, thermal cutouts and dedicated safety circuit. The battery pack can run stand-alone power from the company’s GT-41062 or GT-41080 18VDC external power supplies. It is configured in a soft pack with shrink wrap. The battery pack is compliant with UL1642, UL 2054, UN38.3, and CE standards. Customization options include connectors, custom plastic enclosures, and alternate cell configurations. Globtek is commited to strive for increasing market share by offering high quality products while continuing aggressive research and development of new products following technological trends and fulfilling our customers' demands. Globtek has been providing innovative power solutions for more than 30 years. For example: smart battery chargers offering three-phase operation, medically approved open-frame switchers and rechargeable battery packs providing fuel gauge data. 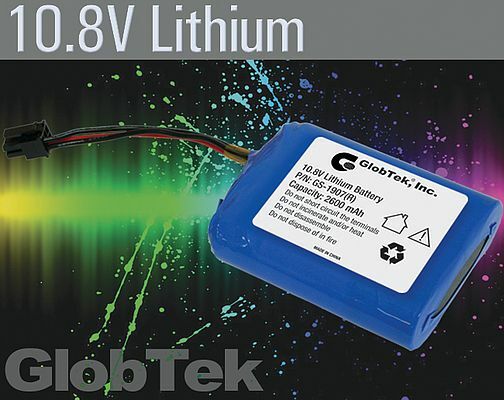 Available in versions delivering 4.2, 8.4, or 12.6V at 1A to address single or multiple-battery configurations, the GTM91128 Li-Ion battery chargers from GlobTek offer three charging methods: conditioning, constant current, and constant voltage. GlobTek's GT-41133 desktop style power supplies with IEC 60320/ C6, C8 or C14 inlets have double-enforced insulation mechanical configurations, regulated outputs voltage from: 12 to 48Vdc in 0.1V increments, up to 90W of continuous output power. GlobTek engineers, designs, and manufactures switching power supplies, medical power supplies, Li-ion battery packs, chargers and cordsets. Standard and customized AC-AC, AC-DC, DC-DC power supplies for requirements ranging from 5W to 2KW. Standard design from stock. Custom design & development. Accelerated "time-to-market"